I know it’s considered bad form to wish bad things on anyone…but I suppose everyone has their exceptions. For me it’s Republicans and the New York Mets. Why the Mets? As we all know, our team affiliations are formed when we are young, and my formative years were spent in Chicago. These things become ingrained in ways that are unexplainable. Why are our emotions so wrapped up in what team we root for? In my case, being a Cubs fan became entangled in something far larger. Ugh…time for a team shrink? 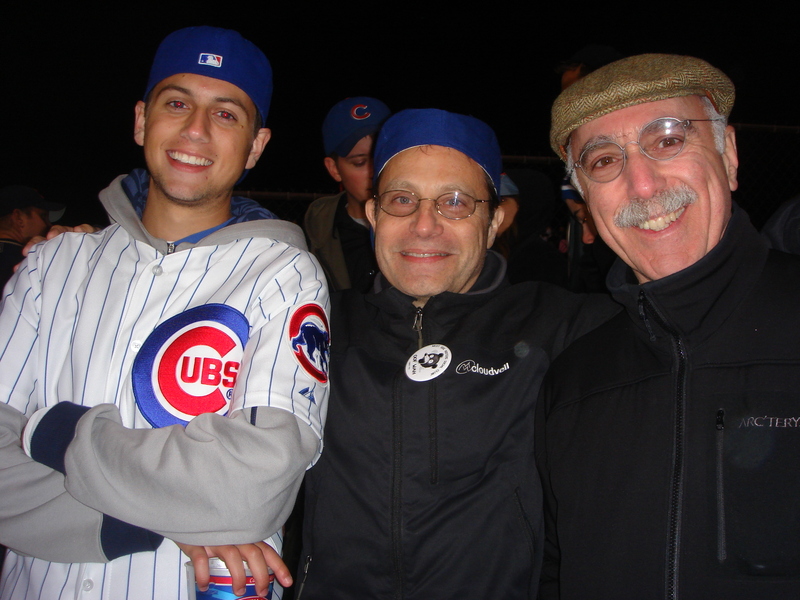 at Wrigley with Leo Gilbert and Richard Brick -- all smiles, but that was before the game! The less said about the Cubs post-season performance, the better. Just know that there is definitely something more going on here than your average 100 year curse. Next year will mark the 101st anniversary of their last championship, and the 60th anniversary of their last World Series appearance. Could that be the omen we’ve been waiting for? 1. Ron santo is one on the 10 finalists on the Hall of Fame ballot. We’ll know if he made it in February. Go Ron! 2. Why not buy copies of “This Old Cub” and “Chasing October” to keep the baseball season alive! 3. We have another Cubs movie coming shortly…watch these pages! 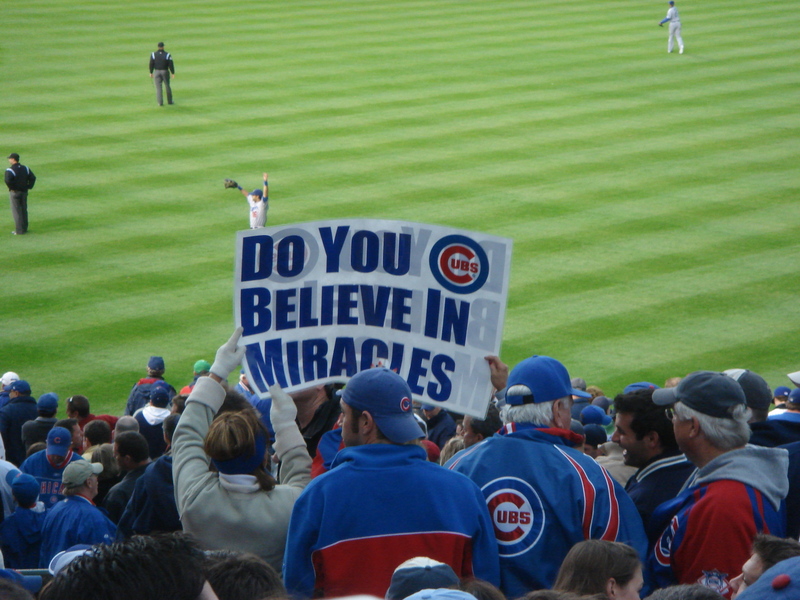 The Cubs are in the playoffs for the second year in a row…a feat that they haven’t achieved since 1907-1908. Is that a sign that THIS COULD BE THE YEAR? I made up my mind many years ago that if it ever happened, I would be there to witness it. And so far I’ve managed to be at every post-season game played at Wrigley Field since the day I was born. Of course, there used to be a simple punch line to that–there weren’t all that many. But lately, the Cubs are acting like they mean it. Please note that I have no special privileges that entitle me to post-season tickets. In 2003, I flew to Chicago for each game, not knowing how I’d be able to get in. I hung out at the will-call window and subtly let it be known that I was looking for a single ticket. I managed to score each time, at only a bit more than face value. But it was nerve wracking to say the least. I’m fine… really I am. It’s not as if we Cubs fans aren’t used to this sort of thing. One thing we’ve learned is to enjoy the ride as long as it lasts. And this year was quite a ride. I made it to Wrigley for the one and only playoff game. I was with Peter Gilbert (of “Hoop Dreams” fame) and his son Leo. The atmosphere was jubilant, but tempered by the history of this franchise. The fact that the Cubs had already lost the first 2 games in Arizona had people a bit nervous. But the snippets of conversation I caught outside the park were all optimistic.